The 49.9 metre motorsailer yacht Global 50-02 has been listed for sale by Georges Bourgoignie and Maarten Ten Holter at Fraser. Currently under construction in aluminium at Turkish yard Ada Yacht Works to a design by Ginton Naval Architects, she is due for delivery in eight months so there is still time for a new owner to personalise the interior. Following in the footsteps of her sistership All About U, she can accommodate 12 guests across six en suite double cabins and is operated by four crew. She comes packed with a number of water toys and tenders including Seabobs and paddleboards. Key features include a sundeck bar and open plan beach club revealed by a folding transom. On the main deck of this yacht for sale, the saloon uses bright white for the walls and furnishings, using accents in grey, oranges and browns for a charming, contemporary living space. Large windows in all four directions flood the interior with natural light and provide excellent views of the surroundings. The formal dining area is positioned forward and seats up to 12 guests. Her top speed is 14.5 knots and she boasts a maximum cruising range of 3,000 nautical miles at 10 knots with power coming from two 800hp Caterpillar C-18-ACERT diesel engines. 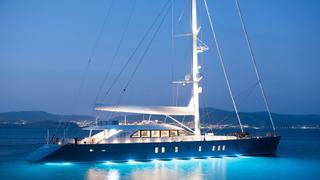 Available to view at the yard, the Global 50-02 is asking €19,500,000.